Time to say goodbye to politics as usual. In another stunning game changer that has further upended the political establishment, President-elect Donald Trump this morning announced the nomination of a mysterious cloaked man to serve as his secretary of the Hook. Yep. Trump promised change, and right away he’s appointing a nameless robed man to lead the Department of the Hook. How’s that for a shock to the system? 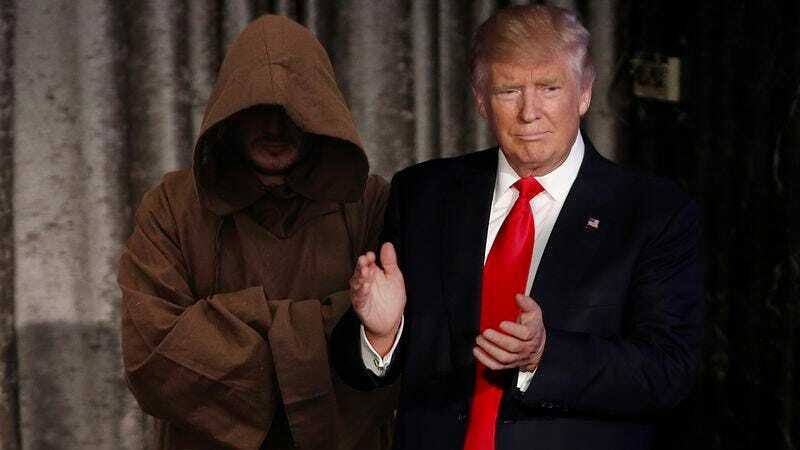 The silent man, whose face is completely shrouded within a thick, hooded cloak, is rumored to have topped the shortlist of candidates for secretary of the Hook after emerging alone from a dense forest at night and immediately causing all greenery within the Washington beltway to wilt. Trump has already lauded his nominee as “a wonderful man with an absolutely tremendous cloak” whom he trusts do an “unbelievable job” discharging the duties of the position, which include abiding by the Hook, interpreting the Covenant of the Hook, and holding aloft the candle whose flame subtracts light from its surroundings. One thing’s for sure: This appointment signals a whole new political era in the nation’s capital. We can’t wait to see how this bold move turns out!